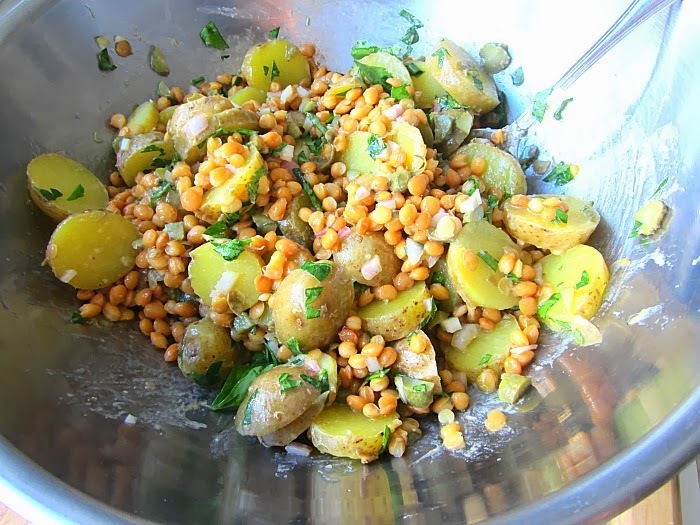 I love me a winter potato salad and I LOVE this recipe. 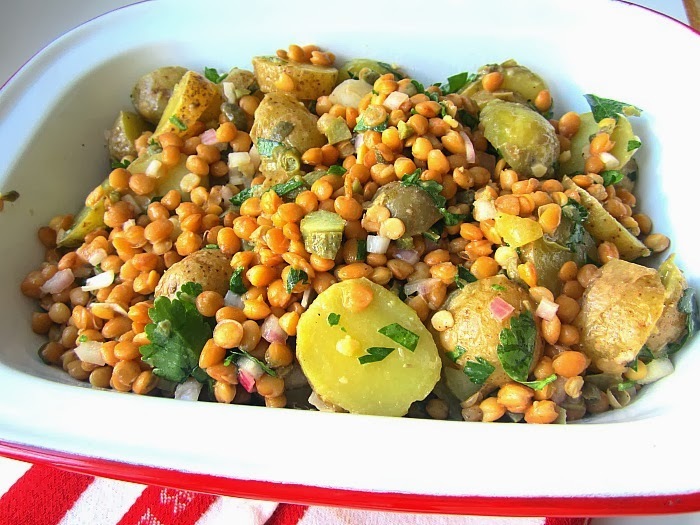 It just makes more sense to eat warm potato salads in the cold weather. The dressing here is like a gribiche sauce minus the chopped egg, but I think a chopped hard boiled egg or 2 would be fabulous. Next time. This salad has no mayo, and uses healthy lentils, so it is a fiber packed lunch, as well as a nice side dish to accompany grilled sausages. 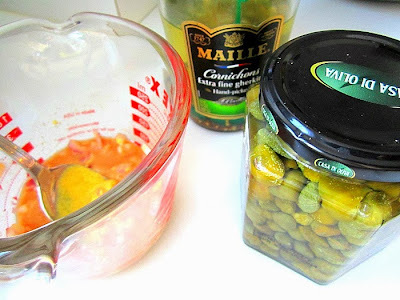 Anything with capers and cornichons makes me happy. Cook lentils: Pick over and rinse lentils. Place them in a small/medium saucepan with the halved shallot, thyme branches, bay leaf, some salt and 4 cups of water. Simmer the lentils over medium heat for 25 to 30 minutes, until firm-tender. Drain (discarding shallot, thyme and bay leaf) and keep warm. Make the dressing: Place the chopped shallot and red wine vinegar in the bottom of a small bowl and let sit for 5 minutes. Whisk in minced garlic, dijon, a pinch of salt, a few grinds of black pepper and olive oil. Stir in chopped capers, chopped pickles and scallions. Meanwhile, cook potatoes: In a separate saucepan, cover potatoes with 1 to 2 inches cold water. Cook potatoes 20 minutes, test with a fork for doneness. Cut into 1/2" slices while still warm and add to the lentils in a large bowl. 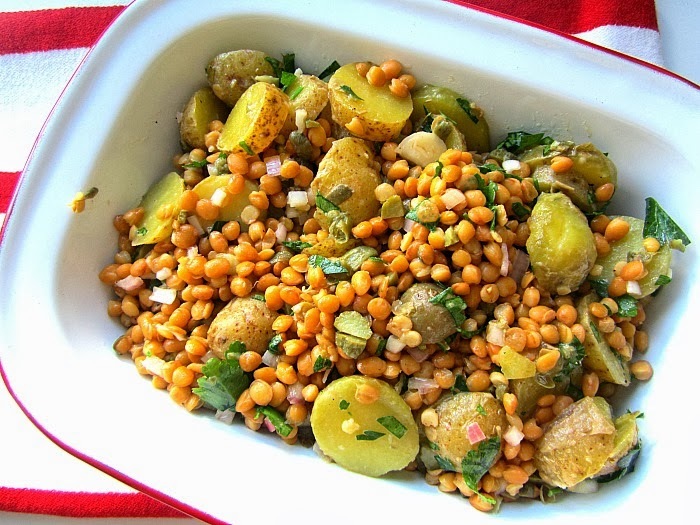 Pour in dressing over warm potatoes and lentils and garnish with fresh chopped parsley. See, winter is good for some things. A wonderful winter salad that suits my taste perfectly, especially with those apers. I love warm salads like this in the winter and it has capers in it too. I would have never thought to pair potatoes with lentils, but it looks delicious. What kind of lentils did you use? In the recipe it says see note up top for varieties. I would suggest Puy lentils. They don't disintegrate. I edited the post to lentilles du puy (the little greenish blue lentils from the Auvergne in France), however, you can use Spanish lentils too, just not the red lentils that get mushy. I have made this for dinner last night with organic non-gmo chicken. It was great. I have used truroots sprouted lentils, these are really great and delicious. It's easy to sprout your own at home if you have time also.